There is nothing worse than when your baby is sick, and sadly Zach has been so poorly this week. It breaks my heart to see him in pain, especially when there's not a lot I can do to help. Thankfully he's on the mend now, but we definitely didn't expect a trip to the hospital this week! It all began on Wednesday afternoon, although at the time we didn't think much of it. Zach felt really warm and was being a bit fussy - we took his temperature although we only had on of those forehead strips, and whilst he was a bit warm we weren't too worried as he didn't seem too distressed. That evening he went to bed as normal and to be honest we thought nothing of it. I wish we had checked his temperature with a more accurate thermometer, but I can't change that now. All this week I seem to have been banging on about how Zach sleeps through the night, so it was a bit strange when he woke up a couple of times although he settled down again very quickly. At 4am though he woke up screaming and screaming. We tried to give him some milk, but he wasn't having any of it and we noticed that he was absolutely boiling. We stripped him down and tried to comfort him and after a bit of calpol and a cuddle he fell asleep again for a couple of hours. It didn't last though and by 7am woke up screaming again. We tried giving him milk, but he still didn't really want any and was just dribbling everywhere. We thought that he was teething and that was what was causing the pain and the temperature but we rang NHS 111 just to be safe. This is something we always so when we're not sure and I would definitely recommend it - you get advice straight away and they can tell you if you need to head to the doctors or hospital. They told us that we needed to take Zach to be seen by the doctor, so we rang and made an appointment and then headed to boots for some baby nurofen, teething granules and a proper thermometer. By this point Zach had settled down and seemed to be feeling a lot better and to be honest we felt really silly for booking an appointment with the doctor. We were sure we'd get there and we'd be told that he was just teething and that it was all completely normal like we normally get told (I've written about that here). In fact, we were considering cancelling the appointment but decided that we would check his temperature first and if he still had a fever we would go. His temperature was 38.2 and the thermometer made lots of loud beeps indicating that Zach did indeed have a fever, so it was off to the doctors! They checked his temperature again and it had gone up even more, and after some all over checks she didn't know for sure what was wrong so sent us off to A&E with a letter explaining what was going on. By the time we arrived at the hospital Zach was fast asleep and again we felt so foolish. A&E is for people with real emergencies and there was us waltzing in with a baby who was sound asleep. But of course we headed in as we wanted to make sure that Zach was ok, and luckily we were given a bed straight away. After just 3 hours they found out what was wrong and we were able to go and collect some medicine and be on our way. People often complain about the NHS, but we had such great service, and I am so glad that the doctor sent us to the hospital. 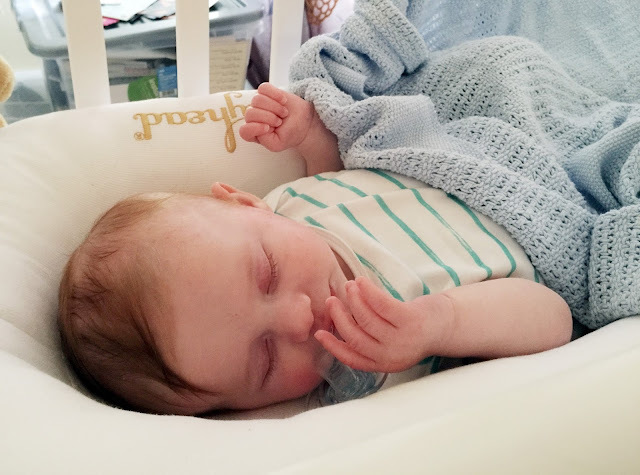 Zach has a bad infection in his throat which is covered in lots of small cysts which caused his temperature and explains why he was dribbling so much and refusing his milk! He's on two sets of medication (which he hates!) as they aren't 100% sure whats wrong as it's still in the early stages but hopefully it won't get any worse no he's being treated for it. Its been a few days now, and he's almost back to normal which is such a relief! He's begun smiling again although not very often, and he's even been practicing rolling over! We've had to cancel a lot of plans this week though which is a shame because they were things we were really looking forward to. But its not fair on Zach to take him out and about when he's not feeling very well. He's also still infectious so that's a worry too. And typically this morning I've woken up with a sore throat, just when I thought I'd avoided it! That must've been scary! Hope he recovers soon and isn't troubled by it too much.